Rain on Main 2017 winner Joshua Wells planned to defend his title at the two-week event, which begins Aug. 10, but his focus has shifted to another project. Wells recently purchased a commercial property in Indianapolis that will become the new home for his art shop, Wicked Kolor. The shop is currently at 770 E. 106th St., Indianapolis. Wells was a graffiti artist while attending Ben Davis High School and later pursued a degree in multimedia at the IUPUI Herron School of Art & Design and ITT Technical Institute. After graduating in 2004, he opened Wicked Kolor that same year. Wells specializes in airbrushing, custom paint and vehicle restoration and modification. Last year, Wells heard about Rain on Main from his wife and thought it would be a fun project. 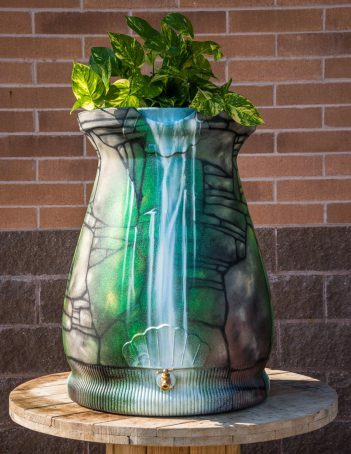 He created a rain barrel that resembled a stone well covered in moss and featured a waterfall. Wells said his focus remained on the procedure and technique he used to paint, and it only took him a few days to complete. The 2018 Rain on Main competition begins Aug. 10 with the weeklong barrel viewing in the Carmel Arts & Design District. It ends Aug. 18 with a silent auction at the Carmel Farmers Market.